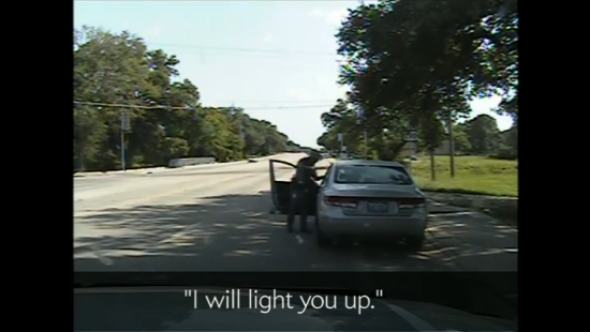 Sandra Bland arrest: Contempt of cop is not illegal. Trooper Brian Encinia threatening Sandra Bland with a Taser after she refused to get out of her car during her July 10 traffic stop in Texas. Slate legal writer Mark Joseph Stern asserted Wednesday that while Encinia was likely within his rights to order Bland to put out the cigarette and get out of her car, taking such aggressive physical action against her when she refused to do so constituted an excessive use of force. And it seems clear from the video that Encinia’s actions, not to mention his initial verbal escalation of the situation, happened in large part because he took offense at what he perceived as Bland’s disrespectful attitude—what is known in legal circles as “contempt of cop”—rather than any belief that she presented an imminent threat to anyone’s safety. A 16-year-old in Portland, Oregon, was acquitted of charges against him in March after a judge found that police had beaten him for no reason other than he had used profanity when responding to an officer who had clapped at him to get his attention. In 2014, the New York Post reported that only 6 percent of cases (in an unspecified time period) in which resisting arrest was the most serious charge against a suspect resulted in convictions in New York City. An ongoing Washington, D.C., lawsuit with multiple plaintiffs accuses police of making bogus arrests under a statute that prevents “incommoding,” or blocking a sidewalk—a statute that itself was put into place after an official 2010 report found that the city’s vague disorderly conduct laws were facilitating improper “contempt of cop” arrests. A D.C. woman won nearly $100,000 in a lawsuit in 2011 after police arrested her when she made a derisive comment toward them at a 7-Eleven. Charges were famously dropped against Harvard professor Henry Louis Gates in 2009 after he was charged with disorderly conduct following an interaction with a police officer that began when a break-in was reported at Gates’ own home. As the Seattle and Gates items suggest, the targets of “contempt of cop” arrests are often nonwhite. When you consider that black drivers may also be disproportionately subject to “investigatory stops,” in which minor motor vehicle violations are used as pretexts for searches and interrogations—and that Bland herself was stopped only for failing to signal a lane change—Sandra Bland’s experience in Waller County might even be considered typical were it not for its tragic end.